UPDATE: I'm adding this picture of Harper and her daddy. I guess I didn't realize we didn't have any of them together - the thing is Scott is the photographer so he always wants to take the pictures which is why he is not in many. Also Harper has MAJOR mommy separation anxiety - I can hardly get out of her sight without her screaming so I'm usually the one holding her. She LOVES her daddy but wants her mommy most of the time. I know in time this will change and it will be all about daddy one of these days. (Mostly because he will probably give her anything she wants). ha! Monday morning after Scott's parents left - we headed down to the beach. Harper took a lot of morning naps like this. We dug what we pegged the "baby hole" in the sand and put blankets and towels on top and put an umbrella over her and she slept for hours this way. I could have slept for days there I think! Steve and Laurie got there around noon and we headed down to Sea and Suds for lunch. Monday night we went back to Oyster House. There was such a difference because it was SO crowded for Labor Day weekend and then we loved watching everyone leave because the rest of our time there it felt like we were the only people in town practically! I think the Oyster House was even better the second night. I got Shrimp Florentine and I think it was my favorite meal of the week. I laughed because someone mentioned on the last post that we used to show a lot of "food" pictures on our vacation posts and now there are none. That shows you how life changes with a baby. I still enjoyed my meals but I was always SO busy keeping Harper happy and entertained that I could barely eat my food much less take pictures! ha! We went and got ice cream at Scoops after dinner. That's a Gulf Shores DO! Laurie and I took this picture. We were laughing wondering where the romantic walks on the beach at night had gone? Five years of marriage and three kids later........and our husbands are asleep watching football on our vacation. ha! (Steve and Scott are going to kill me for this). We were lucky to only have one day of rain. When we got there the forecast showed rain all week but it ended up being really nice. Tuesday was pretty much a repeat - we spent the morning on the beach, ate lunch at Sea and Suds and then Harper got a bath and a long afternoon nap while I stayed inside with her and everyone else enjoyed beach time. (Don't worry - I got to sun on the balcony and enjoy some quiet time)! 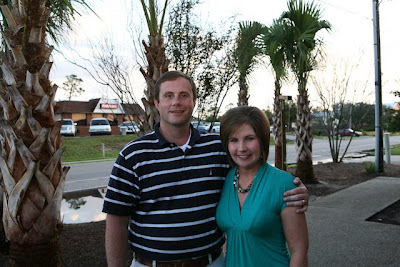 Scott took some pictures of Steve and Laurie before dinner Tuesday night! Our family - ready to go eat! 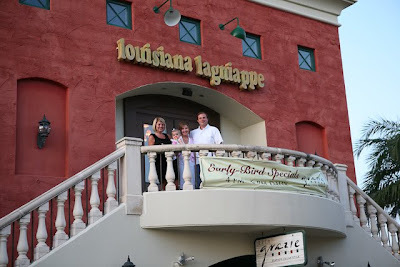 We went to Loiusiana Lagniappe for dinner. It was SO good. We had the best waitress - Susan. She was so friendly and nice. The food was wonderful and we had the best key lime pie ever! We all decided this was our favorite place of the vacation! We got up Wednesday morning and took beach pictures. This was my favorite but it was the first picture we took and I thought we were just practicing and I hadn't put the towel down yet. I love this dress! I will go ahead and tell you that I bought this dress a good year before I ever got pregnant - maybe even 2 years. I just prayed and knew somehow that God was going to give me a daughter. This is the dress that on the lowest of days of infertility - I would go in the nursery closet and get it out and look at it and imagine a little baby girl wearing it. We prayed together as a family on the beach after taking these pictures and I was crying thinking of all those sad days when I wanted a child so bad and all those scary days when Harper was first born - and here we were ......taking family pictures on the beach with a baby more beautiful than I could have imagined wearing that little dress. I just want to tell you if you are waiting - please don't let go of that hope! The last night we were there - we went back to Louisiana Lagniappe. I know that seems crazy. We started to go somewhere else and then decided we really just all wanted to go back there. We even asked for Susan and she served us again. This is the only picture I took that night and it was with my phone. We had so much fun on our trip. Harper was SO good - better than I imagined. I can't wait to take her on more trips in the future! We always have SO much fun with Laurie and Steve. They enjoyed a kid free vacation while their parents baby sat but maybe in the next year or two we will be brave enough to take all the girls on a trip. (P.S. We stayed at the San Carlos Condos - since so many of you asked). Just a note - I have been updating the Prayer Blog with a lot of prayer requests. Please if you can - go there and see if you can find maybe one request to pray for. I know the list can be overwhelming but find one that resonates and pray for it. I know it means a lot to all of these families. If you have a family and/or if you and your family are healthy - please count your blessings tonight and say a prayer of thanksgiving. Thank you!!! Harper is SOO cute. Looks like you had a fun time. Thanks for sharing all the great pictures. Just had to say you have a beautiful family and are very blessed from what I see !! I love your blog, so keep on posting !!! It looks like you guys had a wonderful time! Gulf Shores is so much fun... and I agree... the Oyster House is so good. :) I love reading your blog. I find it so encouraging while my husband and I are away from AR living in GA.
Love all the vacation photo's...especially the beach ones. Looks like you all had a wonderful time! Sending prayers...I closed my eyes...moved my cursor around and when I opened whomever it was on is who I am praying for!! I'm new to your blog, but I just wanted to tell you how beautiful your daughter is! These are great beach pictures. I grew up in Pensacola so I'm familiar with the Gulf Shore area. The pictures make me miss the beach! :) Glad you had a great vacation. What an awesome trip!!! Glad you made it home safely! I've commented on your blog several times. We want to rent a beach house next summer with 2 other families (total of 5 adults and 6 kids, ranging from age 2 to 11). We want a beach house rather than a condo, simply because we don't want other people to hear our kids yelling. Are there beach houses right on the beach in Gulf Shores (and surrounding areas)? Or are the rentals mostly condos? Just looking for ideas from you since you've been to Gulf Shores many times. You can email me back directly at cjacobs@fbdconsult.com...when you have a chance. I love the 'baby hole' you dug for Harper. What a great little napper! Your dress story was very touching, too. Praise God for hearing the cry of your heart and gracing you with a beautiful daughter. Love her pillowcase dress and her monogram! My niece and her dress very similar, monogram, smocked, and BIG bows! Your post made my cry! I did the same thing while we were going through infertility with a bedding set that I bought on clearance. I would go in and imagine decorating our nursery one day, when I was really sad. Well praises, I am PREGNANT (10 weeks)! I will email you when you put your email back up because I had my name on the Dwelling the Land blog. But you might catch it here... Thank you for all of your words of encouragement and faith! 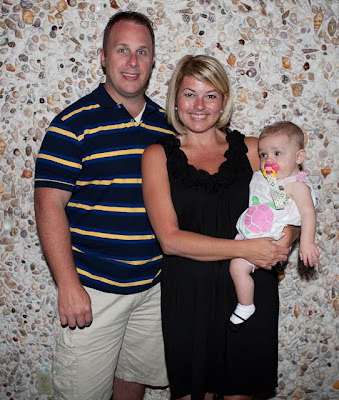 My family and I went to Gulf Shores in July. We had the best time. We ate at Loiusiana Lagniappe. It was by far our favorite place. Our waiter served my daughter first. It made it so nice that she was beginning her meal while we waited a bit more for ours. Your pictures are beautiful. you got some great pictures. family vacations just get more fun when you have kids. Absolutely love the picture of Harper where she is cheesing!!! Sooo cute! 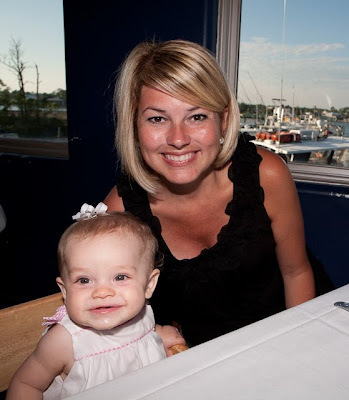 I love the mother/daughter picture...Harper is even smiling with you, so cute! I love the story you shared about the dress...so sweet. Glad y'all had such a nice vacation! Thank you for your encouraging words about infertility. You definetly can relate to those feelings. The pictures on the beach turned out wonderfully! Harper is so adorable sleeping on the beach. It looked very relaxing! I am crying seeing that verse and then those sweet pictures of sweet Harper. I have so many of those moments, Kelly. When I just stop and remember "A year ago when I was doing this, I was so hopeless." And then I look down and there is the sweetest baby girl and I am overwhelmed by God's goodness and His faithfulness. I love the beach pics!!! So glad you had fun! 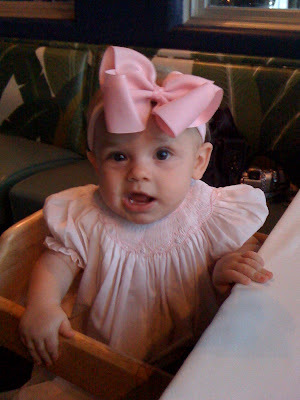 OH- and the pink smocked dress Harper is wearing in the last night's dinner picture is the same one Avery Kate has!!! Love it! Such beautiful pics!!!! I love what Harper's pink and white dress means to you. I praise God everyday that we are expecting a little girl. I spent many days myself in waiting to be blessed. It really puts things into perspective that you are really not in control. Glad to see you had so much fun Kelly! LOVE all of Harper's attire!! SO cute!! Looks like you all had a blast. I LOVED your dress story. She truly is a miracle! BTW-Don't feel bad about going to the same restaurants multiple times--we always do that and usually I order the exact same thing every time! seriously you're the cutest mom EVER! The mother daughter picture of you and Harper is PRECIOUS! I sooooo wish our girls could play together. LOVE IT! That one is my favorite! Your pictures are just so adorable- I LOVE the one of Harper in the dress you bought a long time ago, where she is grinning so big. Oh! Just melted my heart! You went to so many of my favorite places to eat! Ribs and Reds, Sea and Suds..oldies but goodies! Kelly!!! I HAD to comment because I MADE HER BEACH PICTURE DRESS!!! Seriously! You ordered on Etsy from my shop! Wow! That is so cool!! So happy you had such a wonderful time. Harper looks adorable in all the pictures. You are blessed. Thank you for sharing your vacation with us. I love vacation, especially when you get to go out to eat all the time! What fun! What a beautiful family! Girl, you were not kidding about those ruffles!! Where do you find all these wondefully girly ruffley clothes? I don't think I own one thing like that. I absolutely love the pics of Harper on the beach in her dress. They look professional. The light is perfect. 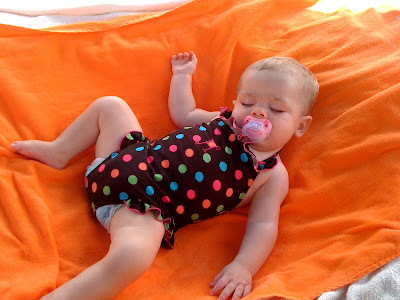 And the one of her sleeping in her bathing suit is precious. To respond to your post on my blog. I've read your blog every day since I found it!! I live in the same town as JMom (Lots of Scotts) and I found your blog when she asked for prayer for Harper. And, I had NO CLUE that I had made that dress for you until I looked back at my etsy account. I knew it looked familiar...lol! This is soo cool!!! LL is one of my most favorite places EVER! Yum! Beautiful pics, fun times! What beautiful pictures! Thank you for sharing them with us. Harper is so precious... what a blessing from the Lord. Tears came to my eyes when I read about the dress you bought long before she was around. I've done the same thing... glad to know it's not just me! Enjoy your blessing! Bless you and your beautiful family. You look lovely in your shorts, you should definitely wear them more often. I'll bet they'll grow on you as Harper becomes a toddler and preschooler and you have to chase her around and deal with her tugging on (and lifting up) your dress. Can you tell I speak from experience? 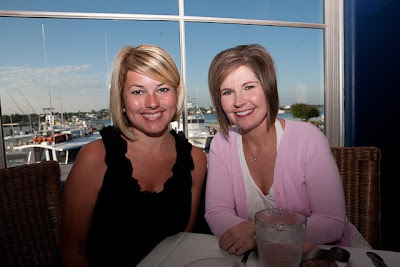 I have to tell you how much the two of you look alike in the mommy & me picture. You have the same jaw line and eye shape, though I think Harper has Daddy's nose. We have stayed at San Carlos twice and absolutely love it!! It is so much nicer than the other condos we have stayed at in Gulf Shores. Great pics! I'm glad you had such a good, sunny time in our state! that dress she is wearing is so cute! you are a beautiful family! What a fun looking vacation Kelly! ~Wow! I have never seen such pretty baby girl clothes. 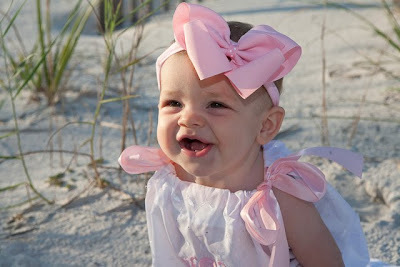 Where did you get that cute little white dress with pink shoulder bows for Harper? Cant believe how big Harper is getting, the doll! This looks like it was such a fun, relaxing vacation for you all! 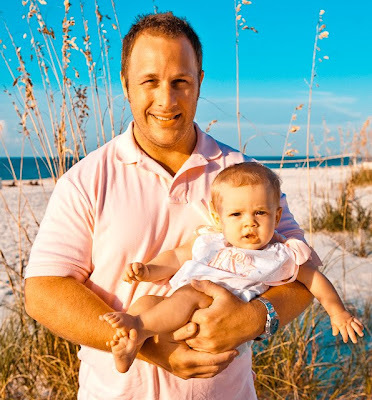 Very cute pictures and a very sweet story about your little girl's pink dress. BTW- my husband works for the bank you blogged for and your little blurb was advertised on their online banking website! I was so excited to show him! Sounds like you had an awesome time. 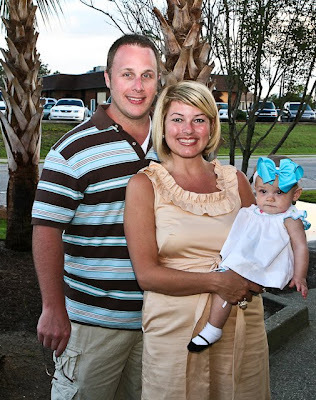 We ALWAYS eat at Louisianna Lagniape in Destin. It's located on our condo property so we usually always walk. What wonderful pictures and such a beautiful family. Can't wait to meet ya'll next month! The picture that you took on the beach are absolutly BEAUTIFUL!! I love the picture of Daddy and Harper!! You can see he LOVES his baby girl. You are so right about it switching out with her "parent of choice". My Dylan goes through fazes all the time. Some months he is all about Mommy and others he is all about Daddy. For the most part London, who is 11 months, doesn't seem to favor being with one of us over the other. But I'm sure she will go through this one day too. I love the story of that dress. You must have already had her name picked out then? I knew from the time we financially able to have another baby that our next one would be a girl and had her name picked out for two years before having her. I would be at Gymboree (you know how I love that store! haha!) and say "I can't wait to have my little London to dress!" People thought I was nuts, but I just had a peace about it. I love my son more than I could even tell you and he is so, so special to me because of what he and I have been through together and because he is why we have our family today, but my heart yearned so badly for a little girl also, and I knew I would have her one day. I tell her all the time she that she is every bit of what I ever dreamed of. :) I know Harper is the same for you! I'm enjoying all the GS pics! They are all so good! God is SOOOO good! PLEASE promise me that you will take that sweet outfit of Harpers after she outgrows it and frame it in a shadow box with that verse in it and even that picture of Harper on the beach as well. Hang it in your living room or bedroom or anywhere! What a memorial ... a reminder ...of God's faithfulness. Love your blog! Must tell you, Harper is gorgeous! You have a beautiful family. Harper is always dressed so beautifully. I've emailed you previously, as I am a fellow Arkansan, living near Magnolia. My grand daughter is the same age as Harper. Please share where you buy Harper's clothes? Now, I am concentrating on Halloween outfits, not costumes! Any advice where I can find cute outfits? Thank you so very much. Love your blog! Thank you for sharing!!!!! What gorgeous pictures! And thank you so much for sharing the story of the dress. It made me cry...both because of the sadness of infertility, but also with happiness at how your story has turned out. I know this must be like a dream come true for you. 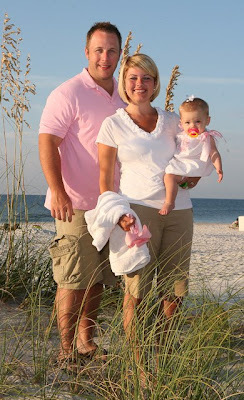 You, your husband and a precious baby girl at the beach. Loved this post! The pictures are great! I am already praying for Harper's surgery next week. Kelly...I LOVED all the pics :) Your family is so precious. After I read your "secret closet" post (a long time ago) and showed us the things you had purchased before you were even pregnant, I did the same thing. I have a precios little collection of clothes, bibs, burp cloths, etc. I am praying daily that our Lord will answer our prayers with a baby soon! Thank you for remembering all of us on the journey of trying to have a baby. Harper is getting so big, and I love her little bathing suit :) Looks like you guys had some wonderful meals and fun times . . . but hopefully got to relax A LOT! That story about the dress has me in tears! Enjoy that she only wants her mommy because all too soon she will want daddy and that will probably never go away! At least that is what I am feeling right now. My daughter only wants daddy to rock her to sleep, we are potty training and she wants him to take her potty, she wants him to get her milk!! She even told me to be quiet the other day because she wanted daddy to sing instead of mommy!!! AGH!!!! Looks like you had so much fun on your vacation. I think Harper gets cuter everyday. She is such a doll. Lok at all those family pictures. I am sure you have way to many to choose from for a christmas card! It looked like you all had a wonderful time on your vacation. The picture of the guys sleeping cracked me up. The three of you are the cutest looking family. Thank you for reminding me/us not to give up hope. I'm really trying, but sometimes it's really really hard. Oh the pictures of Harper on the beach in 'the dress' are priceless, I hope you are going to get one or two or even three of those framed and put it up somewhere in your house. I LOVE Loiusiana Lagniappe. Good call on going back for a second time. The pictures are absolutely beautiful. Those last ones with Harper in the monogrammed dress that you bought long before you had heard her first heart beat brought tears to my eyes and a renewed sense to keep the faith as I search for my husband. Beautiful pictures of your beautiful family, especially your precious little princess. This is the first time I have left a comment. I have been following your blog since Harper was born. She is sooooo beautiful, and yes you are truly blessed. Love and teary eyed about the dress story. I know how you felt and went through when you was dealing with infertility. I went through it for yrs, finally wanting to have our own about 12 yrs ago we went through all the testing for 2 yr, ending with one try of the IVF and second mortgage on our house.Our outcome wasn't a miracle like your, broke our hearts when it didn't work. But we do have 2 kids we adopted through DFS as infants, they are 20 and almost 21. I can't really remember how I stumbled upon your bog. I guess GOD. You have been a blessing to me and I love to look at your pictures. I just started blogging a few months back and just started my business of making hairbow, jewelry, scrapbooks and other accessories. My blog is jzaccessories.blogspot.com, and email is jomariehouse@hotmail.com. I love your set up of your blog, it's so awesome. When you have time could you look at mine and give me pointers. I know your time is precious and you have lotsssss of email and post to read and respond to, but I would love to have a small input of what you think. Is the price right on my items? Does it look inviting or confusing, how is it displayed, can you tell what they are by the pictures, is it attractive enough you would buy, and be truthful I value your opinion or I wouldn't of ask. It is amazing and gives me cold chills sometimes when I read your blog on how GOD has used you and your blog. I"m excited to see how he continues to use you. For what it's worth, I am proud of you and think it was awesome you stepping out of you comfort zone, listening to GOD when he told you to speak to the babies having babies, and the Baptist home. God is using you in unbelievable ways, just keep on listening, he will give you the strength, the words and the guidance to talk to whoever may need to hear what you have to say. You are a beautiful women in more ways than one and a heart of gold. Harper is too sweet, and I love your ruffly dressiness! oh Kelly, you made me tear up! I am so glad you got your beautiful girl. What a sweet story about that dress. Wow, keep that dress forever and ever! You guys got lots of great pictures! I enjoyed seeing them. I laughed about you saying you barely had time to eat your food--much less take pictures of it! Ha! I understand that completely! Love all of your outfits! The smile on Harpers face with you and her at the restraunt is way darling. Love the picture of the guys on the couch! Looks like a great trip! wow blessed beyond measure! love the story of the dress! I loved seeing the picture of Gulf Shores beach. Such a different look than I am used to. I am originally from Tampa, Fla., so I am used to seeing palm trees at the beach. 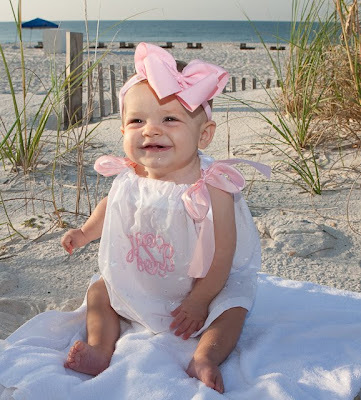 The northern gulf is a completely different beach with sea oats and dunes.The pictures of Miss Harper are adorable, especially in the"baby hole". The picture of the guys zonked out on the couch is great. But where are the "bathing beauty" pictures of you and Laurie? Did you guys get in the water? Someone else suggested framing Harper's dress with the story to go along with it. What a great idea! She would cherish that. Whenever we go to the beach, we always take our photos in the evening. The evening light makes for nice pictures! 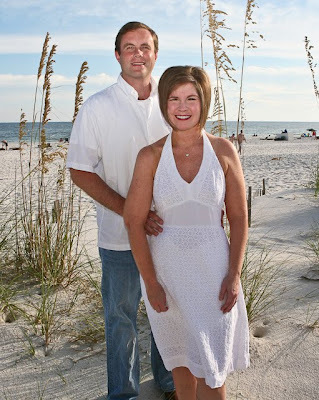 We love Gulf Shores, I really CANNOT believe that you didn't eat at Lambert's Cafe! It's the main reason we keep going to Gulf Shores, also we were in Tennesse over the summer and drove to Missouri just to go to Lambert's! Well worth it. There's always next time! Harper is such a gorgeous little girl. You are blessed. we have always loved louisiana lagniappe too. they have one in destin too that we always go to. they have WONDERFUL seafood. Ahhh! Tell us where you got that dress that's black with the flowery/ruffly top- JCrew? It's so adorable! I love your pictures...it looks like such a great time and Harper is so beautiful - she's growing SO fast! Beach trips are the best & your pictures are fabulous. You are so blessed to have such a sweet little family. I have been reading your blog since Harper was born and it is amazing to see how God works in so many different ways. It is nice to get spiritual uplifting verses and real life praises and prayers. You are an amazing person and keep on doing what you are doing. Love all the pictures. Key lime pie sounds sooo yummy!!! I love Harper's little white dress. She sure is beautiful. Sea N Suds has the best fried shrimp on the entire planet! What beautiful pictures, and a beautiful family! 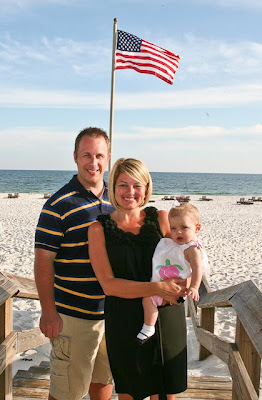 When we lived in Alabama we went to Gulf Shores often, now we live in TX and it's not as easy :-( I miss it! I love your Jcrew shirt. I have the pink one and it is so cute for pictures.